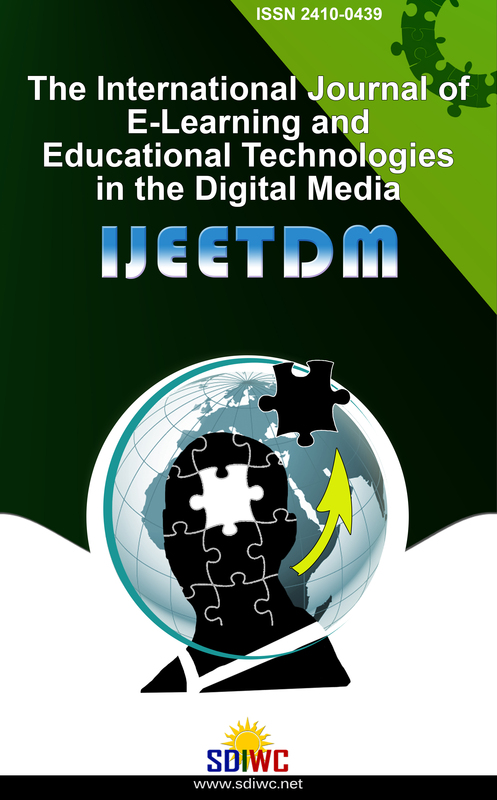 The International Journal of E-Learning and Educational Technologies in the Digital Media (IJEETDM) is a refereed online journal designed to address the following topics: Intelligent Tutoring Systems, Security Aspects, Immersive Learning, Computer-Aided Assessment, Collaborative Learning, Errors in E-Learning-Community Building, Accessibility to Disabled Users, Context Dependent Learning, E-Learning Platforms, Portals,Mobile Learning (M-Learning), Learning Organization, Standards and Interoperability, Virtual Labs and Virtual Classrooms, Digital Libraries for E -Learning, Joint Degrees, Web-based Learning, Wikis and Blogs, Authoring Tools and Content Development, Synchronous and Asynchronous Learning, Medical Applications, E-Learning Hardware and Software, AV-Communication and Multimedia, Ontologies and Meta-Data Standards, Simulated Communities and Online Mentoring, E-Testing and New Test Theories, Supervising and Managing Student Projects, Distance Education, Pedagogy Enhancement with E-Learning, Metrics and Performance Measurement, Assessment Methods in Blended Learning Environments, Assessment and Accreditation of Courses and Institutions, Course Design and E-Learning Curriculae, Lifelong Learning: Continuing Professional Training and Development, Theoretical Bases of E-Learning Environments, International Partnerships in Teaching, Distance and E-Learning in a Global Context, Cooperation with Industry in Teaching, Higher Education vs. Vocational Training, Critical Success Factors in Distance Learning, Technology Enhanced Learning, Interdisciplinary Programs for Distance Education, Impact and Achievements of International Initiatives, Technology Support for Pervasive Learning, E-learning in Electrical, Mechanical, Civil and Information Engineering, Groupware Tools, Educating the Educators, Blended Learning, Assessment Software Tools, Teacher Evaluation, E-Learning Success Cases. As such, IJEETDM reserves the right to select only best submitted papers for publication. All submitted papers would be reviewed by at least two reviewers and one member of editorial committee. Please refer to Authors Guidelines for details of reviewing process and to submit your papers please refer to Submit a Manuscript. IJEETDM is an open access journal which means that all content is freely available without charge to the users or institutions. Users are allowed to read, download, copy, distribute, print, search, or link to the full texts of the articles in this journal without asking for prior permission from the publisher or the author. This is in accordance with the BOAI definition of open access.